Patrons of the River Tales Classic Car show enjoy a great show. Cape Girardeau - The River City Rodders Car Club in conjunction with Old Town Cape will be hosting the River Tales Classic Car Show on Sunday, September 20. 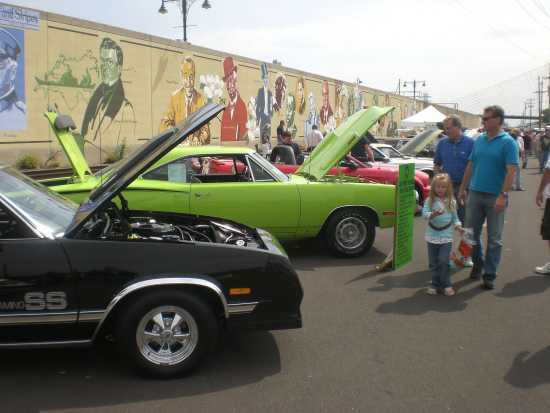 The Rodders' 32nd annual car show will again be held in historic downtown Cape. Vehicles will be displayed along Main St. and in the downtown parking lot across from Hutson Furniture. Over 200 cars and trucks are expected this year, with entries from as far away as St. Louis and Memphis. Trophies will be awarded in thirty-one classes, with classes available for most vehicles from 1900 through 1999. In addition to the class trophies, special trophies will be awarded for Best Paint, Best Engine, Rodders' Choice and Old Town Cape's Choice. Registration fee for participating vehicles is $15. A sound system will be playing oldies and attendance prizes will be given away throughout the day to registered participants. Registration begins at 8:00 with judging scheduled to begin at noon. Trophies and other awards will be given out at 3:00. As in the past, there is no attendance charge for the general public. Additional information regarding pre-registration and classes can be obtained by visiting www.rivertalesclassic.com. The Rodders' car show is an annual fall tradition for area car buffs and for many years was held in Capaha Park. It was moved to downtown Cape in 2007. In the interest of showcasing the downtown attractions, the Red House, Old St. Vincents, the Glenn House and the River Heritage museum will all be open the day of the car show. In addition, many of the local restaurants, shops and antique stores will be open during the day. During the event, the Southside Optimist Club will be sponsoring the "Duck Races" to benefit the fight against childhood cancer and "southside" programs such as the Family Resource Center, Boys and Girls Club and True Vine Ministries. Heat races are tentatively scheduled for 1:00 and 2:00 along the riverfront. Anyone interested in sponsoring a duck can contact Peder @ 587.7373 or visit "duxonmiss.org." For additional information on the River Tales Classic Car Show contact the River City Rodders at 335-1704 or Old Town Cape at 334-8085 or visit www.rivertalesclassic.com.